New health and power bar textures inspired by Limb0's Renaitre bar textures. 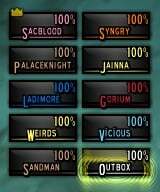 I developed these frames for use when I PvP on my Warrior. I was having trouble gauging how much rage I had at any given moment. I tried to create these frames to make seeing how much rage I had quickly and easily. The frames are very sparse since I really don't need a lot of frills. I tried to put as much important information into as small a space as possible while maintaining maximum readability. I play at 1920x1080 so these may look off if you use a different resolution. These frame are based on oUF_Karma and share many of the same features. 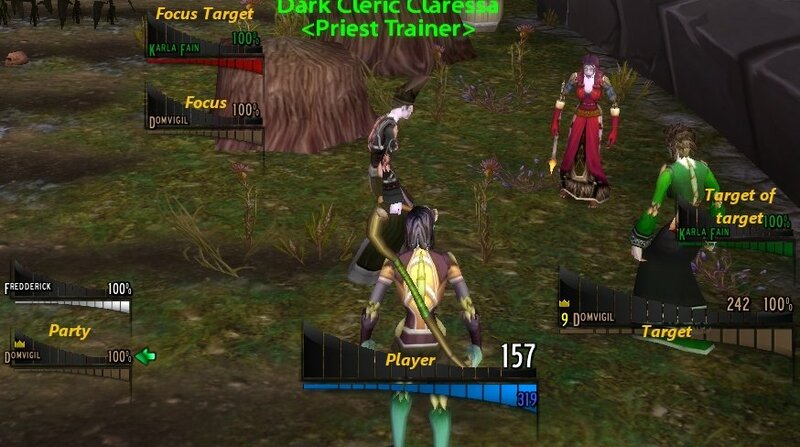 Player, Target, Target of Target, Focus, and Party. NEW! Raid frames now working. Drakull, Neverg, and Monolit. Most of the code and inspiration came from their layouts. A special credit goes to Hankthetank for his awesome raid target markers. Animated combo point display inspired by NugComboBarClassic by d87. This is my personal layout and should *not* be considered finished so expect bugs. Some features may not be fully functional or working at all. I will not take feature requests. If you want something changed or added please feel free to add it yourself. New ten segment texture as opposed to the 14 segment older version. New castbar and special power (totem, soul shard, etc) texture. Various bug fixes and code clean up. Redesign of the layout to better show low health situations. Fixed a bug in the PvP icon display. hey do you plan on updating these unit frames? they look amazing and i really would like to use them. no matter what ouf version i use, they wont work.. Sorry I really don't have the time. I don't play anymore, at least with no regularity. Most likely it just needs the tag file updated. ich habe das Problem das ich bei einem Char alles super eingestellt bekommen habe und es auch super ausschaut. nur bei meinen anderen Chars ist davon nichts zu sehen und die Blizzard UnitFrames überall da sind. oUF & oUF_Sandman ist aber für alle Chars aktiv und läuft laut WoW Addons Einstellungen. so wie ich es sehe und Empfinde sind es ja keine Speziellen einstellungen für einen Char sondern für alle und da müssten sie auch bei allen dann so da sein. Der Char bei dem es geht ist ein Diszi Priester, bei allen anderen die es so gibt gehts nicht. Last edited by peace1980 : 09-14-13 at 02:54 PM. These Unitbars just look great! I also tried to change the health in the player frame to % but could also not find the right code. While reading trough the files I found in lib.lua that the RUNIC_POWER color is commented out. Why is this? After a quick look it would be easier to use sandman as a starting point since it has most of the needed code. I love the work you have done on oUF_Karma, oUF_Fail, and of coarse oUF_Sandman The problem I'm having is picking just one So I'm trying to take the best elements from all 3, and making them as one, and tweeking them to fit my needs. So what I was wondering is, how would I go about adding the oUF_Sandman raid frames to like oUF_Fail? It would take a bit of work but it could be done. You'd have to copy the textures from sandman to which ever layout you choose as your base. Then you would need to created a variable in the config or just call the proper texture in the layout file. I'm at work so I can't look at the code but I'll see what I can come up with when I get home. If you don't learn something new everyday, it is a day done wasted. You saw something that inspired you to create something new, I'd consider that artistic and I applaud that. Looking at what you've created as a texture, I would simply clean up the "jaggies" on the upper/lower curve and modify the highlight to maybe look like a knife's edge. Also I'd want to space the segments so the top and bottom layers line up nicely, but instinctively I think of 10 segments instead of 14. See things I don't even notice. I actually had no idea how many segments were there. I just split it where I thought it looked good. I would love to see what you can do with it. As I said I'm not very good with the artwork and such. The fact that it doesn't look like something my 7 year old threw together is a testament to the quality of your work. On a separate note I've been working on the raid frames and target textures. Let me know what you think. Limb0 you deserve all the credit. Your work is amazing. It would be awesome to collaborate with you, but I don't know how much I would have to offer. I am not very artistic. Cool layout and thanks for the credit. Feel free to modify any textures I upload, or if you'd like I'd be happy to collaborate on a "Sandman" texture with you. @Monolit - thanks for the input. I agree the target arrow looks a little out of place. I'm going to work on something else see if I can get it o match up better. Thanks, I'm working on some raid frames atm I'm just not sure what direction I want to go with them. I was never really happy with Karma's raid frames. Thanks drak I wasn't really happy with the original textures so I started again from scratch. I'm much happier with the new ones. They have a much more refined look. I'm going to fool around with reversing the target bar fill direction but for now I'm pretty happy with the look.